The Ring Doorbell is an excellent introduction to smart home security and a great way to fend off porch pirates. When we originally reviewed the Ring Video Doorbell ($99) in 2015, a lot was different in the smart home world. For one, while the Amazon Echo was available, Alexa hadn’t yet become the household name it is today. Do-it-yourself home security was still in its infancy. And there weren’t many other video doorbells to be found on front porches. How things have changed. 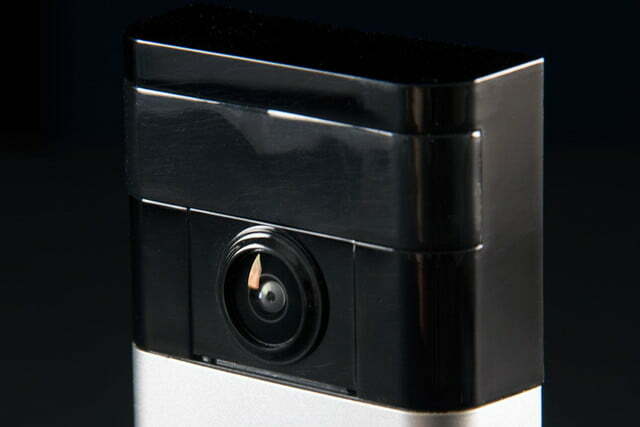 From Nest to Wisenet, many companies are launching video doorbells of their own. Ring’s original doorbell debuted at a price that’s $100 more than it costs today, and now the company has four different doorbells, including the Doorbell 2, the Pro, and the Elite. It also has several outdoor security cameras on the market, including the Spotlight Cam, and recently introduced the Ring Alarm, a home monitoring security system. So when we re-read the words we wrote in 2015 about the original Doorbell Cam, talking about the device’s “home security potential” we had to chuckle. Because in just three years, Ring’s original product has helped video doorbells become a must-have component of smart home security, alongside smart locks and video cameras. So, how does the original doorbell measure up against increasing competition? We put it through a series of real-world tests over a period of several weeks. Here’s the good, the bad, and the unexpected. At roughly five inches tall by two-and-a-half inches wide, Ring is is bulkier than Ring’s Doorbell Cam Pro or Nest’s Hello video doorbell. Add to that a depth of nearly one inch, and you’ll find that it stands out, literally, but a bit less so on modern facades. The case comes in several different finishes, including nickel, bronze, and antique and polished brass, so you should have no trouble matching the rest of the surrounding trim. 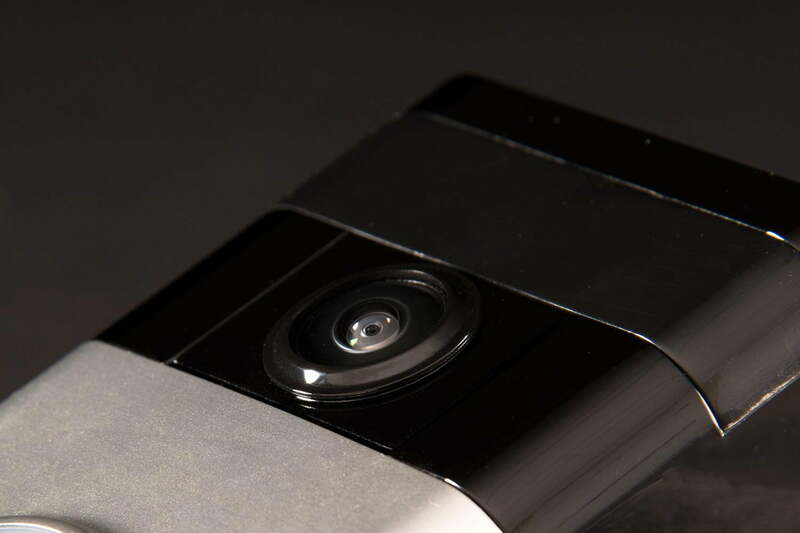 On its face, the half-inch camera lens peers out innocuously from above the quarter-sized button and will go unnoticed by most who interact with the device. It is constructed in a sturdy manner, but the case components are largely plastic, belying the device’s quality. The girth is not much of a factor however, since the device spends nearly all of its time affixed to the wall by an included mounting plate. 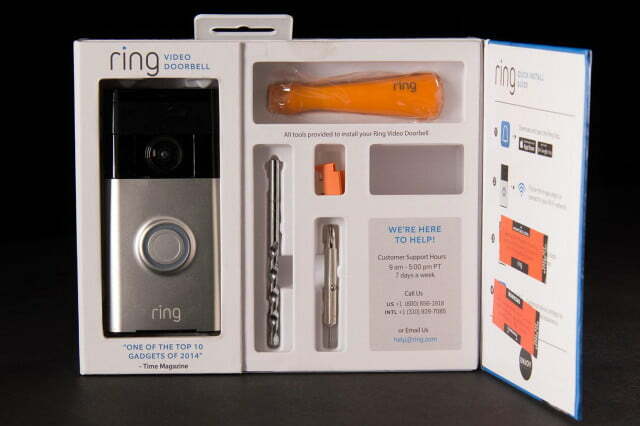 The package contains the Ring doorbell itself, the mounting plate, a two-foot USB charging cable, mounting hardware to accommodate various building materials, a drill bit and small screwdriver to aid installation, and a set of installation instructions. Setup is simple, with the Ring app and instructions providing clear, foolproof guidance through from start to finish. After downloading and installing the app (for iOS and Android), it’s a mere matter of creating a Ring account and following the steps as presented on your phone. The Ring is more noticeable than the traditional buzzer found on most homes. If you’re planning to use the Ring wirelessly (as in, you’re not connecting it to a circuit or are replacing another battery-powered doorbell), we’d suggest making sure that it’s charged fully first, as it will be relying on its battery as the sole power source. If you’re replacing an existing doorbell, you’ll obviously want to shut off power to the circuit before doing so, but attaching the existing wires to the included mounting plate is fast and easy work. The mounting plate attaches to the wall with a few standard pieces of hardware, and the main component then latches on to the mount with four small hooks. Once settled on the hooks, just tighten up two under-mounted barrel screws with the included screwdriver, and you’re good to go. All told, the entire process probably won’t take more than 30 minutes to complete. 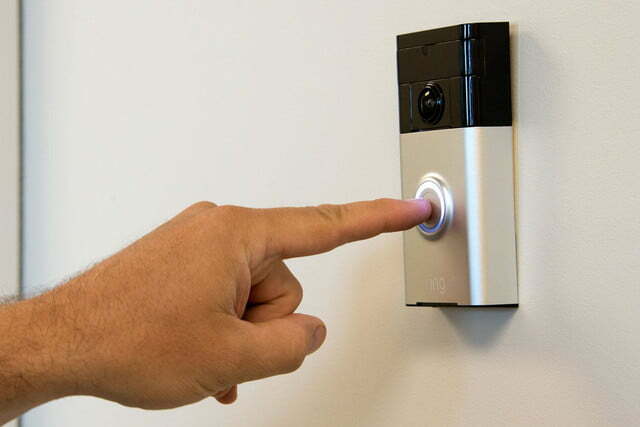 From a guest’s perspective, the Ring is as easy to use as any other doorbell. A press of the button sets off feedback in the form of a pleasant three-toned chime from the panel, and a blue LED that rotates in a ring around the button. Some visitors who used the Ring exhibited confusion, due mainly to the device’s unusual form factor. “It doesn’t look like a doorbell!” they’d say. 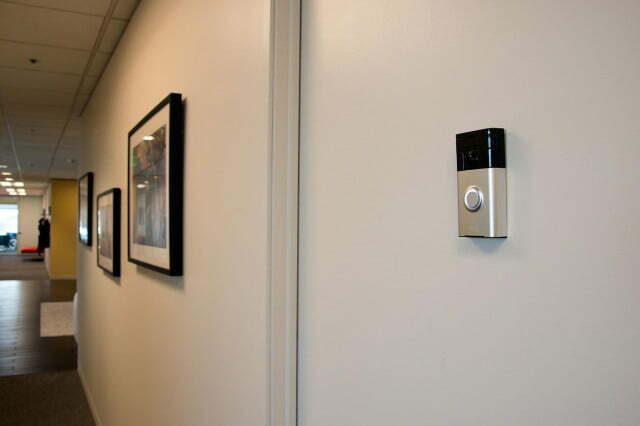 The chime activates on the phone through the app within about five seconds of the button press, but unlocking the phone and connecting to the camera can cause enough latency that users may make it to the door in less time than it takes to respond via the app. 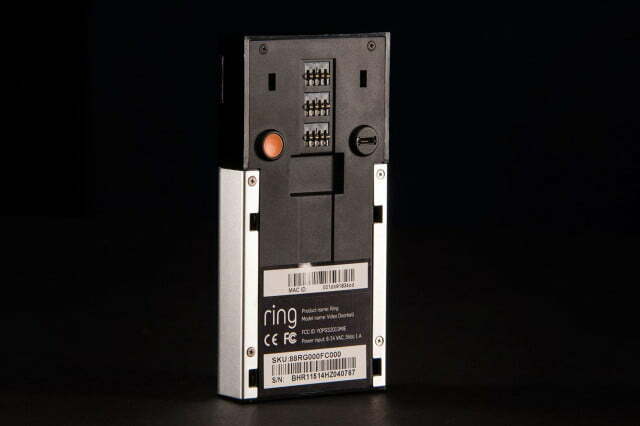 Ring also offers a “Chime,” an indoor speaker accessory that you purchase separately. It connects to any standard outlet and will sound throughout the house like a more traditional doorbell — a useful and welcome addition, especially if not everyone in the household has the app installed. However, adding additional users to your Ring account is easy. The app itself is relatively intuitive. When responding to a push notification from the doorbell, you have the option to answer or decline the call while viewing your visitor through the Ring’s wide-angle lens. Once the call is answered, you can converse with the visitor through the doorbell’s built-in speaker and microphone, with options to mute either from your end. If you decide to decline the call, the visitor is given no indication that you’ve done so. Multiple doorbells can be managed through the app, but each will require an additional subscription. Now that Ring is owned by Amazon, the doorbell integrates with the voice assistant, and you can answer your doorbell from your Echo Show or Echo Spot device. 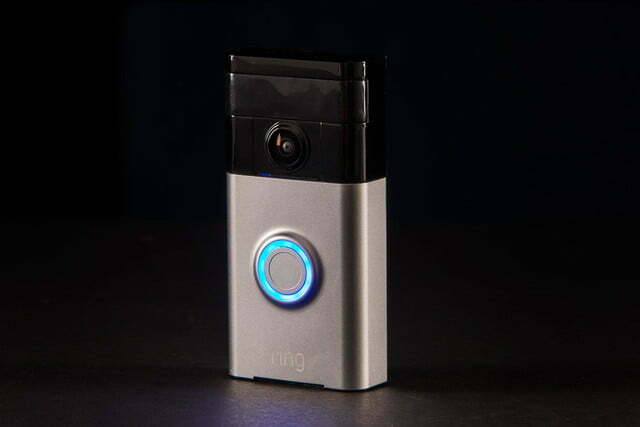 The security applications are as tremendous as they are obvious, especially when taking advantage of Ring’s cloud recording function, which enables a user to review footage recorded by the doorbell over the previous six months, if you’ve subscribed to Ring’s monthly service. More on that later. 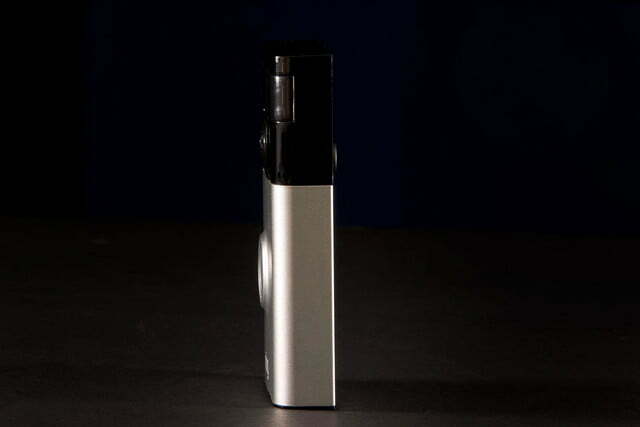 The built-in motion detector can be configured to begin recording when motion of any kind is detected. 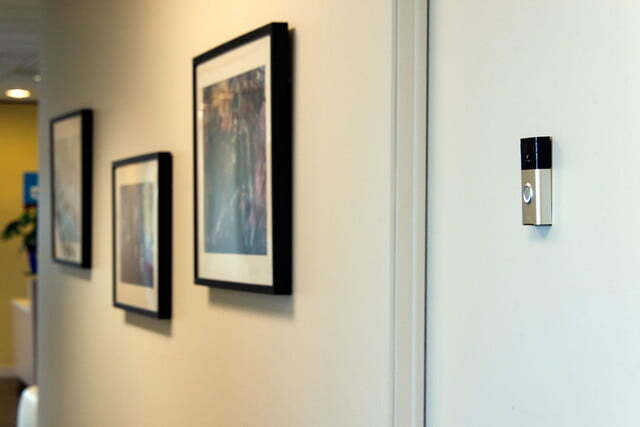 The detector’s active zones can be custom configured within a distance of 30 feet, so you should have no problem if your door happens to face a particularly busy street. Audio and video fidelity is decent and does a good job of filtering ambient noise and light. The frame rate is a bit on the low side, with some visible lag, but it suits the device’s needs well enough. If it’s mounted anywhere near an average height (roughly four feet off the ground), the 720p, 180-degree field of view should be more than enough to capture whoever is standing at the door. Enhanced night vision means that you’ll be able to see footage from your porch even when it’s dark. 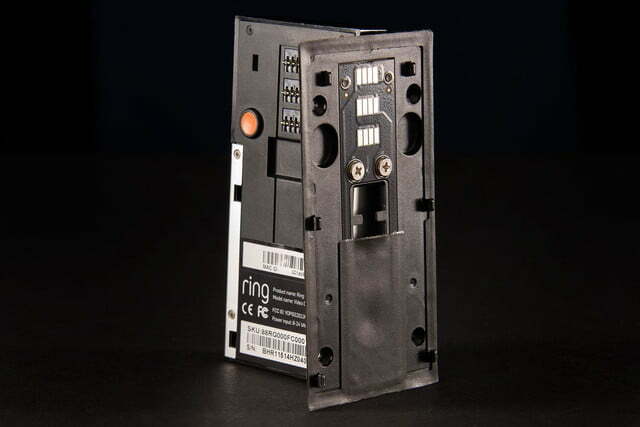 Ring offers a one-year warranty on parts and lifetime purchase protection. 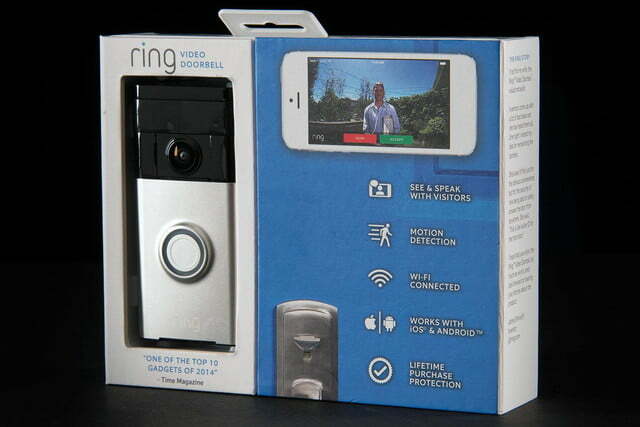 We think the Ring Video Doorbell is a great addition to any home, and at just $99, is a steal. If you’re looking for a sleeker, slimmer device and are willing to pay more, check out the Nest Hello doorbell ($229), or the Ring Video Doorbell Pro ($249). Keep in mind that both devices require hard-wiring, though. Ring is a well-established home security company that has a great reputation for quality products. Now owned by Amazon, we expect Ring to add to offerings while continuing support for existing products. Yes. 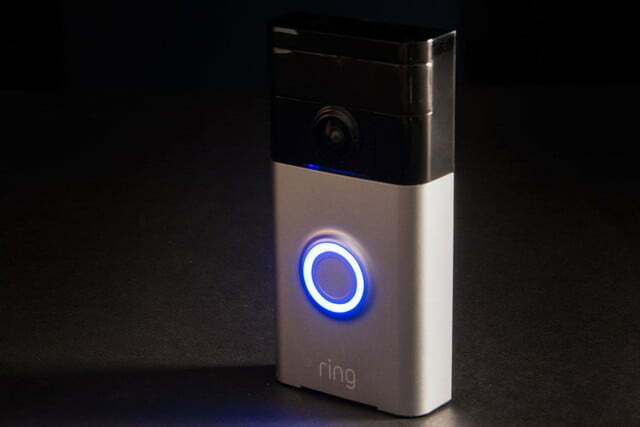 The Ring Video Doorbell is a simple, effective, low-maintenance way to monitor your home. Updated January 26, 2019 to note that the Ring Doorbell now works with Alexa.